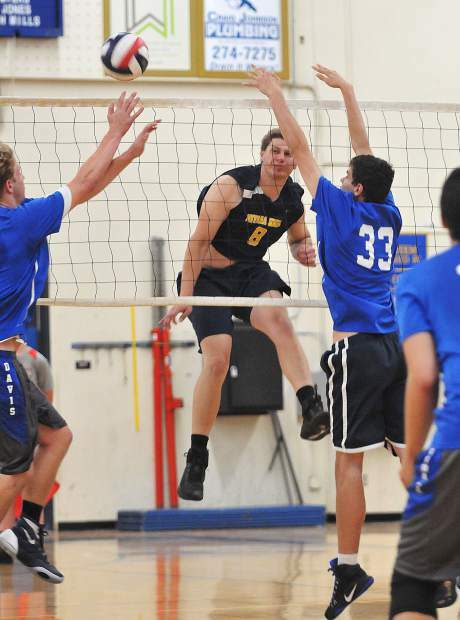 Nevada Union boys volleyball team captain Nick Ashbaugh lobs a ball over during Tuesday night's first round playoff win over the visiting Davis Blue Devils. 6' 2" Nevada Union High School junior Cameron Dallago, hits the ball over the net during the Miners' first round playoff win over the visiting Davis Blue Devils. 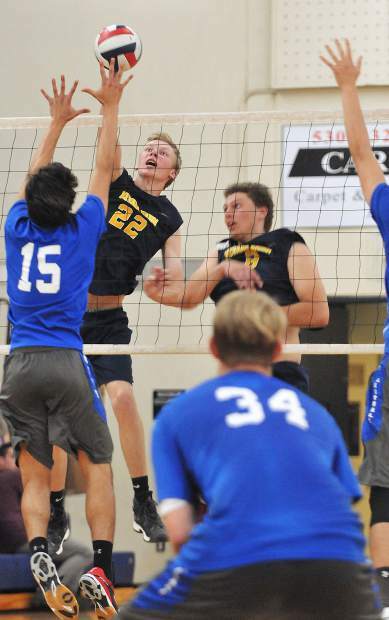 Nevada Union High School senior Tanner Quiggle (22) spikes a ball down forcefully to score a point for the Miners en-route to their win over the Davis Blue Devils in four sets. 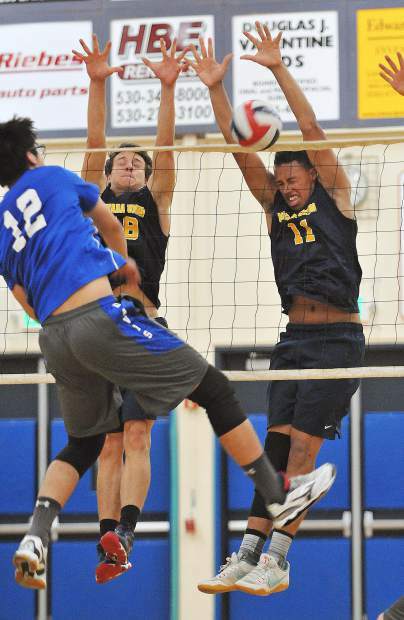 Nevada Union's Preston Nowak (18) and Cameron Dallago (11) make the block for a point against the Davis Blue Devils Tuesday at the Albert Ali Gymnasium in Grass Valley. 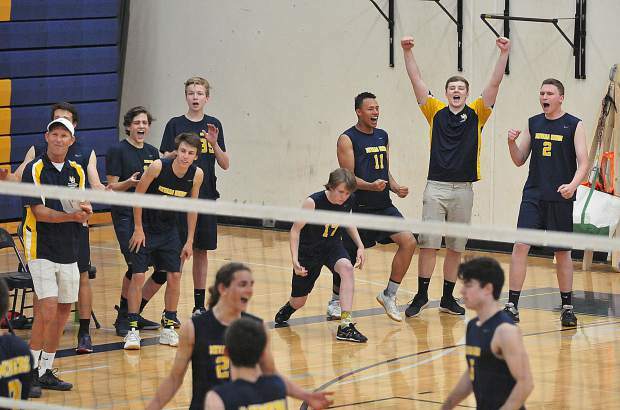 The Nevada Union varsity boys volleyball team reacts after scoring one of their final points in a four set match playoff win against the visiting Davis Blue Devils. Nevada Union's Preston Nowak (18) slams the ball down for a point during the Miners' playoff win over the Davis Blue Devils. Nevada Union varsity boys volleyball head coach Lance Mansuetti talks over a few pointers with the team during a time out. 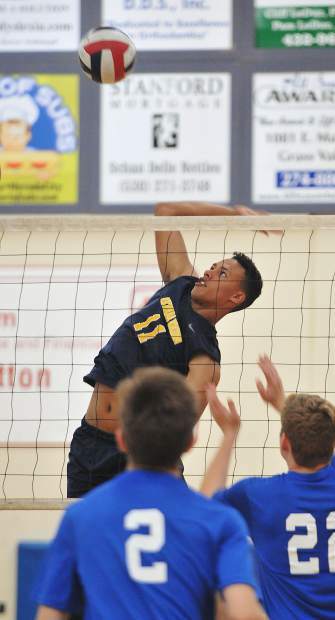 6'5" Nevada Union Senior Ibrahim Torkman gets a spike past the Davis Blue Devils defense during Tuesday's home playoff win. 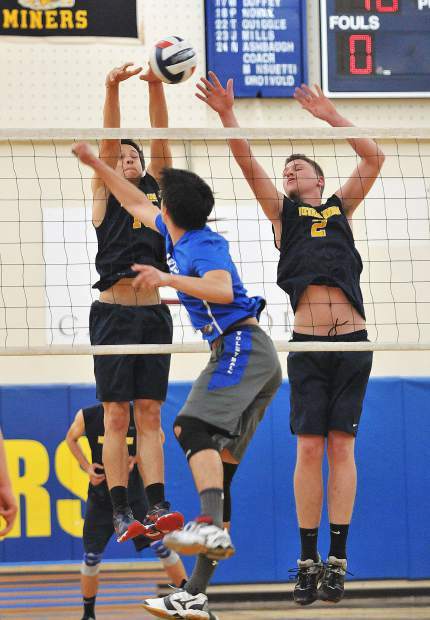 Nevada Union sophomore Preston Nowak (left) volleys a ball back over the net towards the Davis Blue Devils during the MIners' first round playoff win. 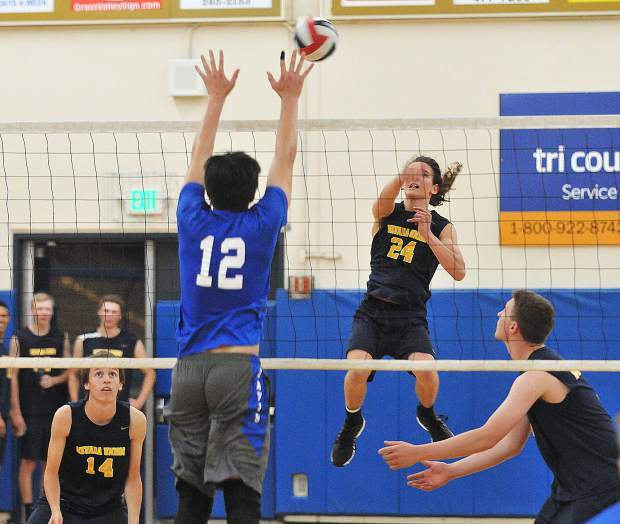 With their usual complete team effort and highly-potent attack, the Miners knocked off the Davis Blue Devils in the first round of the Sac-Joaquin Section Division I boys volleyball playoffs Tuesday night at Albert Ali Gymnasium. Nevada Union, the No. 3 seed, took care of business in four sets, topping No. 14 Blue Devils, 25-16, 25-23, 19-25, 25-13. After buzzing through the first set, the Miners found themselves playing from behind in the second set, but rallied late to go up 2-0. The Miners were a bit sloppy in the third set and despite a late push, couldn’t pull off a late rally. After dropping the third set, the Miners came out swinging in the fourth set and jumped out to a 7-2 edge behind a couple Jordan Mills aces and high-flying kills. 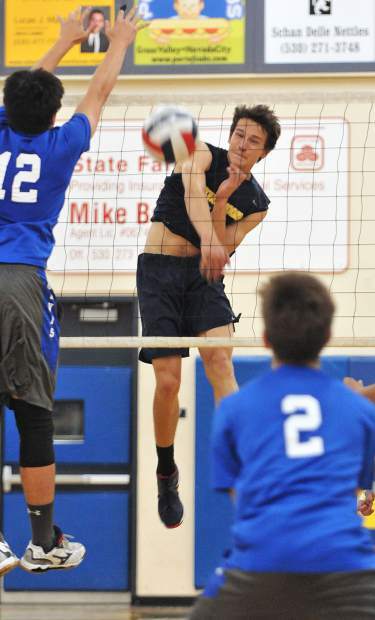 Leading the Miners was Nick Ashbaugh with a team-high 19 kills. Mills was next with nine kills. Tanner Quiggle added seven kills, Preston Nowak had six, Ibrahim Torkman also had six, Riley Nelson had five kills and Cameron Dallago had four kills. Of the 11 Miners that played, 10 tallied kills in the win. Doing a solid job of setting the NU hitters were Sam Hales and Trevor Johnson. Senior Libero Joey Cena led the defense with 24 digs. 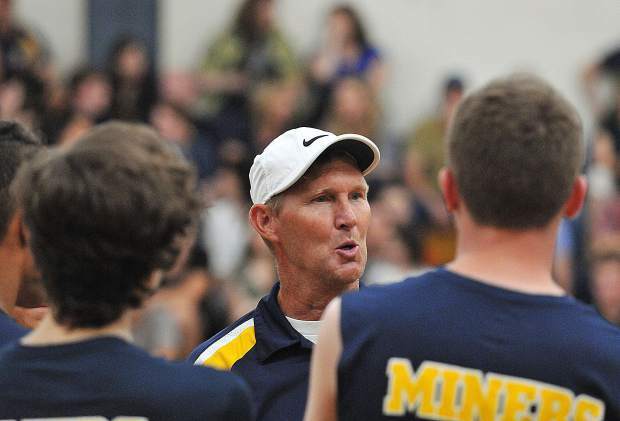 The Miners (30-4) never trailed in the fourth and decisive set and will now advance to the second round of the playoffs Thursday, where they will host the winner of the No. 6 Elk Grove vs. No. 11 Ponderosa first round matchup.